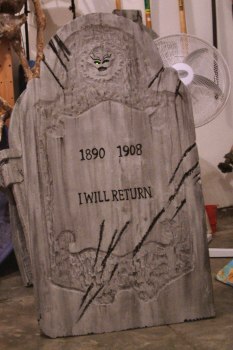 Page 2 ~ Adding LED eyes | Need epitaphs? 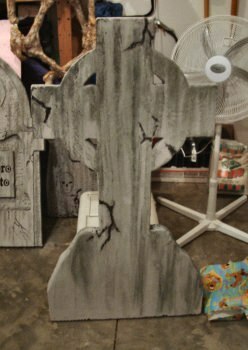 Make your own bone yard filled with gothic headstones to chill the souls of the living and warm the rotting hearts of the dead. 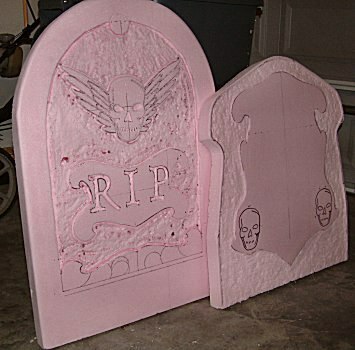 These foam tombstones are fun to make, and will get lots of attention for your front yard haunt. All you need are a few tools and some imagination, and you don't really need that if there's a cemetery close by. Inspiration is just a graveyard stroll away. 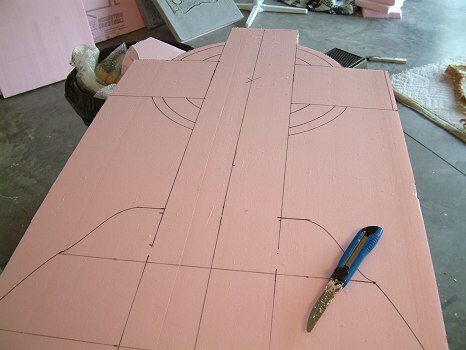 4'x8'x3" pink foam board Get this at your home improvement center. You can break the board in half to get it to fit into the back of your SUV or "Le-Car". 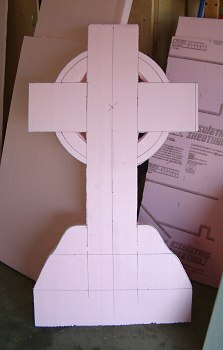 If your foam board has a plastic film covering, remove this before you start carving. 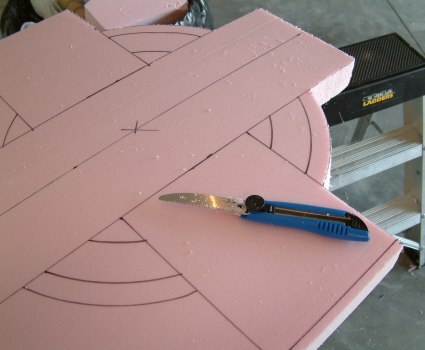 Small saw or knife You'll need something to carve out the basic shapes of your stones from the foam board. Anything with a serrated edge will work. Dremel or wordworking tools Although not strictly necessary, a Dremel really makes the detail work go faster. If you don't have one, you can use simple wood working tools to gouge out your designs. Flat latex paint 1 gallon black, 1 gallon gray. Sand A small bag of play sand from your local hardware store works great. Coming up with cool designs is the best part about making your own tombstones. 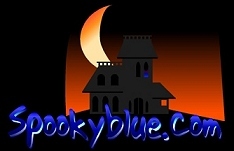 If you can't come up with anything on your own go to the internet or even better, to your local neighborhood cemetery. I generally start by cutting a slab about 48" by 30". Choose your own dimensions according to how tall and how wide you want your tombstone to be. 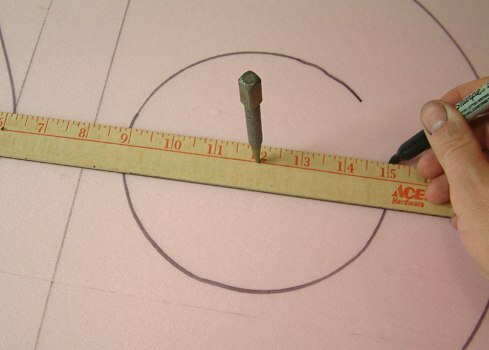 Map out your design by first marking a center line. Then take your measurements from there. It'll help keep things even on each side. A French curve is great for scribing ornamentation. For larger arcs and circles you can use a compass or make your own using a yardstick. Drill a hole in your yardstick, find the center spot of the circle you want to scribe, and stick a finishing nail or a thumbtack (I used a nail punch) through the hole. 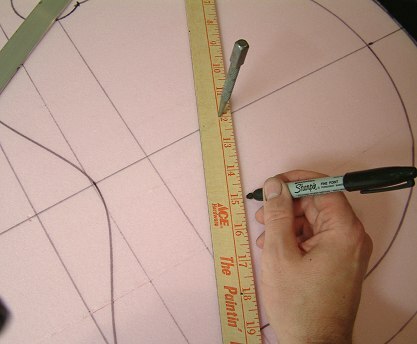 Measure out from the center, place your Sharpie, and slowly turn the yardstick. You can cut notches in the yardstick to keep the marker from slipping. Here we see the evolution of a Celtic Cross. 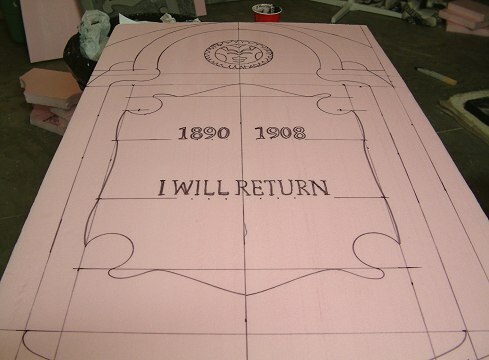 Once you have the center line of your slab it's very easy to lay out the gist of the rest of your tombstone. The small handsaw came from Ben Franklin's ($2.00). When planning detail work you need to decide what are going to be the high and low points of your tombstone. Rout out large areas with a Dremel or with a sharp chisel or gouge. 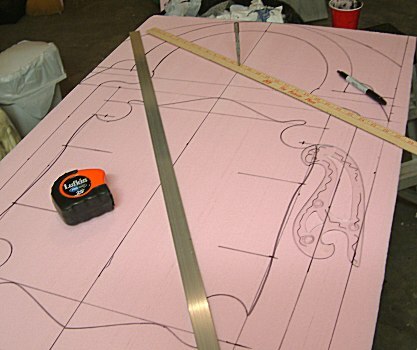 Before using hand tools to dig out large fields of foam, score the edges of your design with a razor knife. This will help to keep you from ripping out chunks of something important. 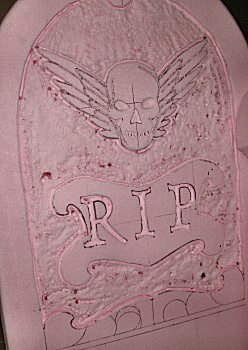 You can transfer designs such as skulls, angels, wings, or armadillos directly onto your foam. Print out your armadillo, then place the paper where you want the final picture to be. Trace with a blunt pencil to leave behind a faint indention. Then just trace the indention with your Sharpie. This also works well for epitaphs. 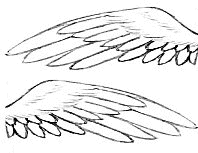 Here are the skull and wings I used. Feel free to use them on your own creations. 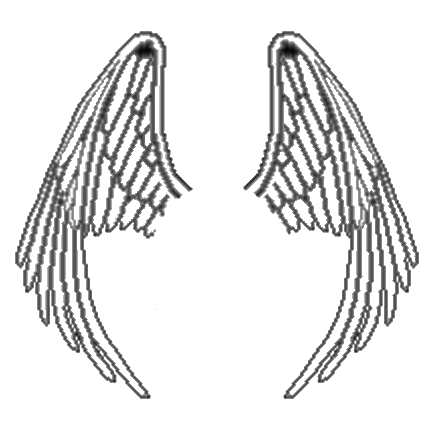 And here is another pair of wings that I kinda like. 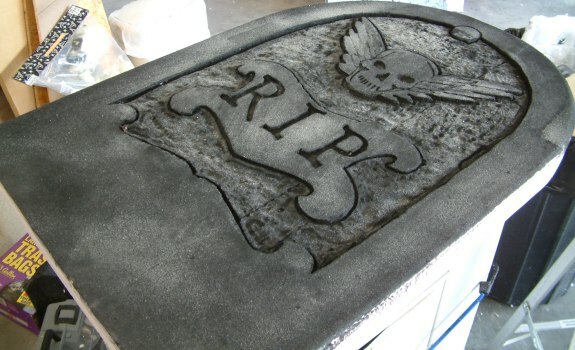 Using a medium grit sandpaper, sand the outer edges and surface of your tombstone. A rough surface helps to hold paint better. This is also the time to carve out a few cracks and other wear marks. You might not be too keen on marring the beautiful work you just did, but just try gouging out a hunk or two from the edge. You'll be surprised how much cooler the stone will look when it's "aged". 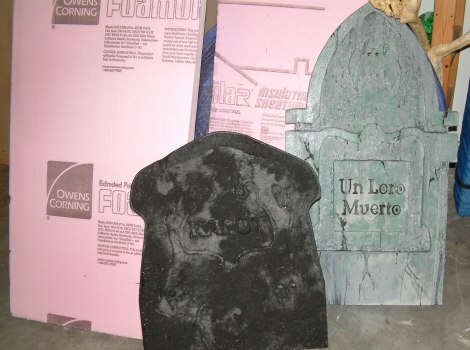 Paint the front and sides of your tombstone with flat black latex paint. Get it into every nook and cranny. While the paint is still wet, sprinkle sand over the surface. Do not touch the surface until it's dry. Throw as much sand on there as you want, but just a little at a time. When the paint is dry turn the tombstone over and let any excess sand fall off. 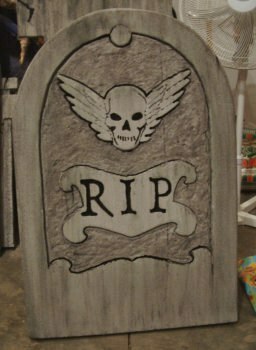 Now paint the tombstone with flat gray latex paint. Deeply cut areas like the letters in epitaphs remain black. Also leave any cracks black. It's really up to you how much of the surface you want to cover. When the gray coat is dry, mix a very thin (more water than paint) dark gray or black. Stand your tombstone up (preferably outdoors). 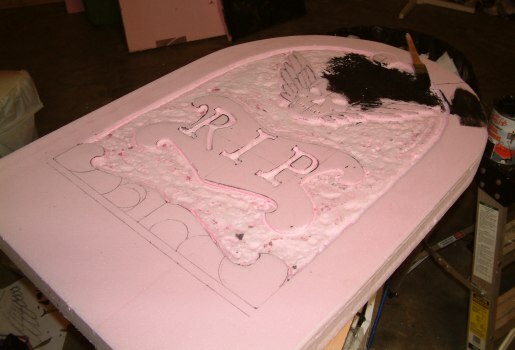 Wet down the tombstone with a hose or a sponge, then dip a paper towel into the "black wash". Starting at the top, drag the towel down the tombstone. Squeeze to let extra paint drip out and let it run down the face. Don't be afraid to use a lot of the thin mixture. Now squeeze more water over the stone or lightly spray with a hose. Don't use very much water or you'll wash away all your paint. The idea is to let some of it wash away and let it pool in other areas to give the surface a weathered look. 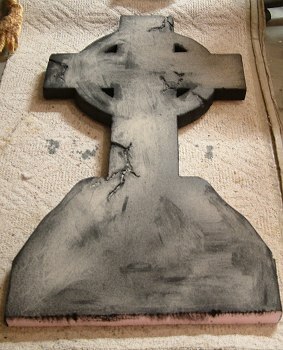 Allow the tombstone to dry and repeat the thin "black wash" mixture application. Introduce other colors. Add some moss. Lightly dry brush some brown or light green all around the edges. If you don't like something you've done then just wipe it off. You really can't screw it up. Set dowel rods or short lengths of PVC into the bottom of the foam, then stick them in the ground. Alternatively, stick your supports in the ground and duct tape them to the back of your tombstone. 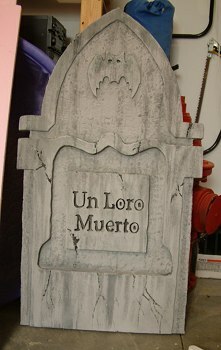 You can further dress up your tombstones by draping cloth over them and adding flowers. If your design has eyes, make them glow with LEDs.